With the original voice of Mickey Mouse, Mickey sings and dances 8 different songs of his friends of the Mickey Mouse Clubhouse, and he explains 8 different adventures. Mickey moves his mouth and arms to the rhythm of the music. Very easy to activate with 8 different buttons to choose the story or song you want to hear. Batteries included…. 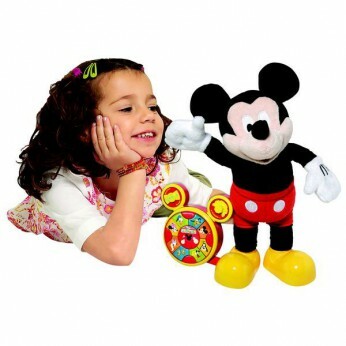 This toy costs approximately £29.99 (for the latest and best prices make sure you check our retailer list for the Mickey Mouse Clubhouse Storyteller above). In our review of Mickey Mouse Clubhouse Storyteller we classed it as being suitable for ages 3 years, 4 years, 5 years but recommend you check the manufacturer specific advice before purchasing.